Our friends in the North, Dabbawal, were invited to become one of the inaugural street food brands in the new HWKRMRKT, a shipping container village under the Tyne Bridge in Newcastle. 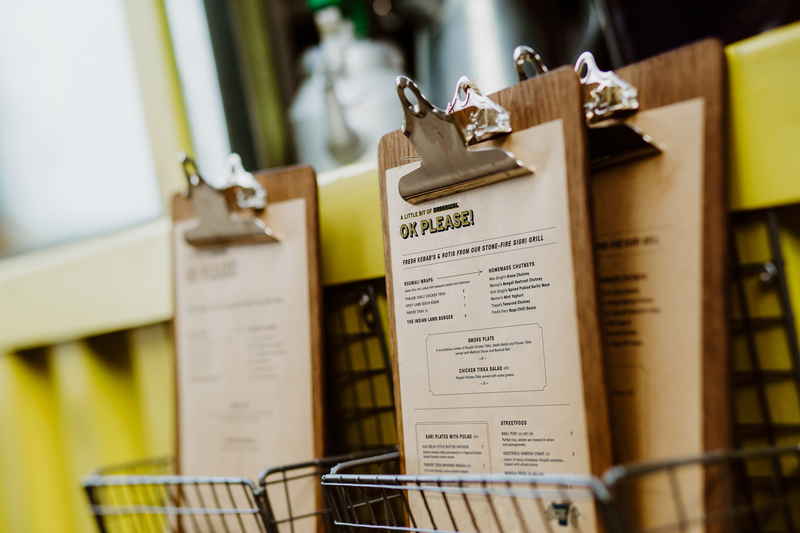 Going back to Dabbawal’s roots as one of the UK’s original street food pioneers. And they asked us to help them brand and design their container. All photography by Anna Miller and Dabbawal. Dabbawal’s founder, Jaf Ali, wanted us to help him create a sub-brand, an offshoot from Dabbawal. And so A Little Bit Of Dabbawal, Ok Please! was born. Using a strong colour palette of charcoal black, yellow and white, a hand crafted logotype and an Everything’s-Ok motif, we created a characterful, playful brand that sits nicely within the Dabbawal family. We designed their range of chutneys, lovingly named after and featuring the chef who created them. From Mamaji’s Bengali Beetroot, to Fred’s Fiery Naga Chilli Sauce.